HMS Royal Ulsterman was a WW2 troop carrying ship called a Landing Ship Infantry (Hand Hoisting) or LSI (H). Its purpose was to carry large numbers of fully armed troops and the Landing Craft Assault (LCAs) they would use to travel the last few miles to the landing beaches. LSIs are often referred to as 'mother ships' because of their 'brood' of LCAs, 6 in the case of the Royal Ulsterman, all securely fixed to hand operated davits ready to be lowered, fully laden, into the water. An LCA typically carried around 36 fully armed troops, which would require the Royal Ulsterman's 6 LCAs to undertake 4 round trips to deliver the full complement of 830 troops to the landing beaches. Steve Robertson's father, S/M Freddie Robertson, was well known to those whose recollections follow, hence the correspondence with Steve. The bulk of the text is from crewman, George M Saunders. In September 1942, the Royal Ulsterman sailed from Penarth, South Wales for Greenock in Scotland, where amphibious training exercises and manoeuvres were practiced on nearby Loch Fyne. These involved embarking the troops into the LCAs, lowering them into the water, navigating to the designated landing beach and disembarking the troops safely onto the beach. 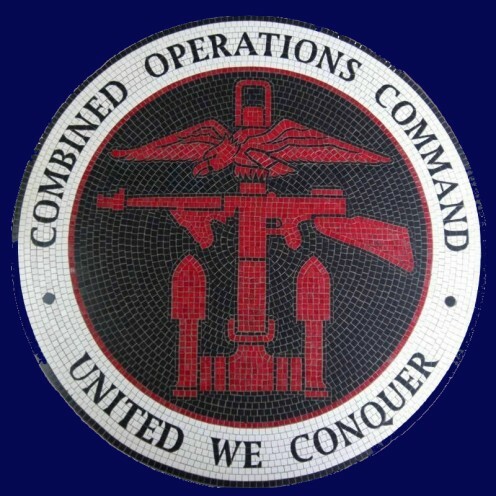 On board were the 1st Battalion, American Rangers and British Army Commandos. On completion of the exercises in October 1942, the ship was provisioned in Gourock on the River Clyde and joined the invasion fleet for North Africa in the 3rd week of October. It was said to be the largest convoy ever at that time. US Ranger, Seymour Miller, recalls, "Yes Steve, I was one of your dad's 'tough cookies' and I do remember the Royal Ulsterman, which I believe was originally a channel ferry. I was on board her for over twenty days en route to Arzew, North Africa. I remember being seasick for the first time in my life. The seas were extremely rough and the removal of part of the Royal Ulsterman's keel, to reduce its draft for work in shallow waters, made it bounce around like a cork... at least that's what I heard. One day a giant wave grabbed a landing craft and left it dangling by just one davit, when a second wave finished the job! On another occasion, I drew guard duty at the foot of the grand stairway that led to the officers' mess. A passing Navy officer offered me a sardine sandwich. After one bite, I decided I wasn't hungry and offered it to the ship's cat, which took a momentary sniff and went on his way. He seemed to be suffering too, which was confirmed next day when I heard he had died! Another first for me was sleeping in a hammock. We slept in what was the enlisted men's mess during the day. The hammocks were good for sleeping in, because there was little sense of the ship's rolling movement; but they were very difficult to get into. There was a delicious aroma of mutton stew, which slowly cooked all night, mingled with the smell of Diesel oil, which pervaded the whole ship. We did envy your dad and his shipmates when they lined up with their tin cups for their daily ration of Rum... it was a wonder to behold!" 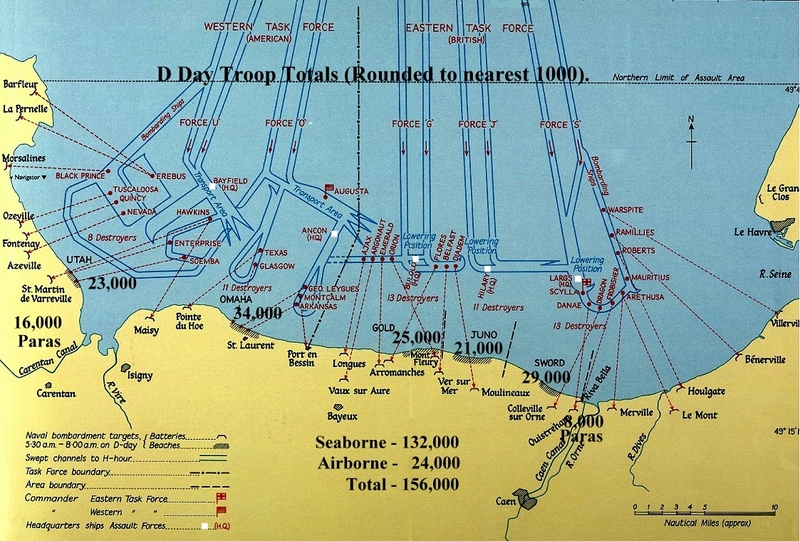 At 2am on the 7th of November, 1942, we landed the 1st Battalion American Rangers assault troops, including Seymour, on beaches at Arzew, a port south of Algiers. There was very little action through the night but by morning Vichy French aircraft attacked causing no damage and were soon fought off. Once the Rangers had consolidated their positions on the beaches, we sailed on to Algiers, companioned by the Royal Scotsman, Ulster Monarch, Queen Emma and Princess Beatrix, where we would transport troops from Algiers to Bougie. If the Germans retreated eastward, there would be a further troop movement to Phillipville and Bone to meet up with the eighth army in Tunisia. The five ships were nicknamed 'The Moonlight Squadron' and the route along the North African coast 'dive bomb alley', because Stuka dive bombers greeted us on every passage we made. 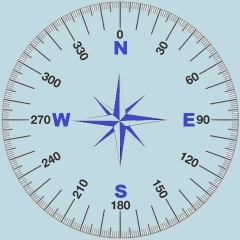 After the fall of Tunisia, we operated from the ports of Souse and Sfax. The next operation we were involved in was Operation Corkscrew, the invasion of the island of Pantelleria, when we embarked troops of the Eighth Army from the North African coast. They were not very happy about it, because they had already fought right through the western desert with Monty. However, the landing at 10 am on the morning of June 11, 1943, was very quiet, although in the late afternoon, we were dive bombed by Stukas flying in from Sardinia after our escorts had left the area. We destroyed 3 of them, which was our best single bag throughout the war. That landing was very easy, because it relied heavily on bombing the enemy into submission. 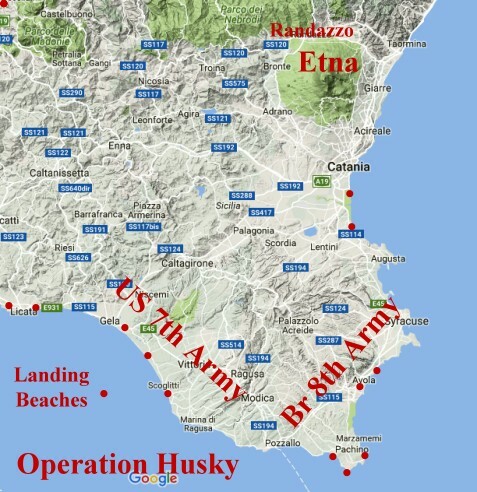 We next prepared for Operation Husky, the invasion of Sicily on 9/10 July, 1943. By this time the preparations were becoming easier for us because of previous preparations for amphibious operations. Before we left Sfax to join the Sicily Invasion force, Lord Louis Mountbatten, Chief of Combined Operations, came aboard and gave us a pep talk. He also arranged for a 6 week backlog of mail to be forwarded to us, from FMO Gibraltar, before we sailed. HMS Royal Ulsterman was the HQ ship for this landing, responsible for controlling the movements of landing craft and personnel. There was fierce opposition when we landed on the southern tip of Sicily at Porto Paolo. The German defences were very strong but our sea and air bombardment overcame the enemy opposition. 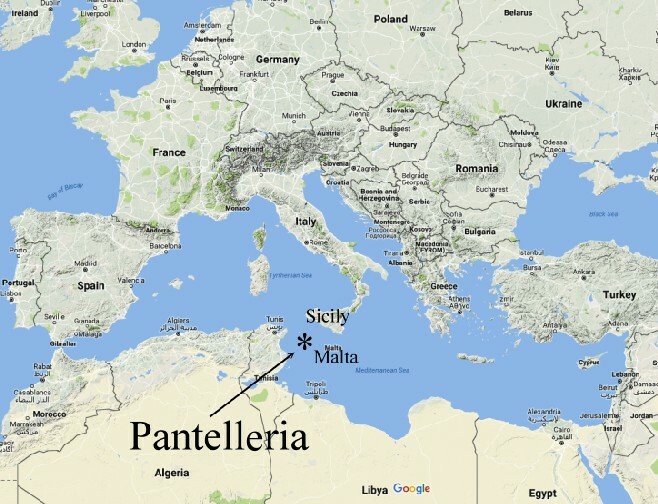 After the troops established a beachhead, they moved inland and we sailed to Malta, where we stayed for 3 weeks, then Tunisia for a spell and then to Tripoli. Meanwhile, Sicily was taken and the Army advanced into Southern Italy, an operation we were not involved in. Later we transported troops between Sicily and Italy, managing to damage a propeller when we struck a wreck in Taranto Bay. We returned to the UK, via Belfast, to pick up a new screw, then on to the Mount Stewart dry dock in Cardiff, where repairs were carried out. The local people of Tiger Bay adopted the ship and presented us with our Battle Ensign as a gesture of their hospitality to the ship’s company. We returned to Algiers to prepare for the Salerno landings on the 9th September, 1943. We thought that it was going to be fairly easy following the surrender of the Italians the day before the landings. To mislead the enemy air and sea patrols, we started northwards towards Naples then turned south towards Salerno at midnight; but the deception didn’t work out! German aircraft picked up our positions as we steered south and German land forces had taken over the shore defences from the Italians. By the time we attempted to land our troops, the enemy were ready for us! It was tough on the approaches and tough establishing a beachhead and getting off the beaches. For some time, we stood by ready to evacuate, however, back-up forces were brought in earlier than intended and tipped the balance in favour of the Allies. It had been an anxious few days with bombing and shelling from shore batteries. We were relieved when our contribution to the invasion of Salerno was over. For us the intense pressure eased off and we enjoyed shore leave in Algiers. 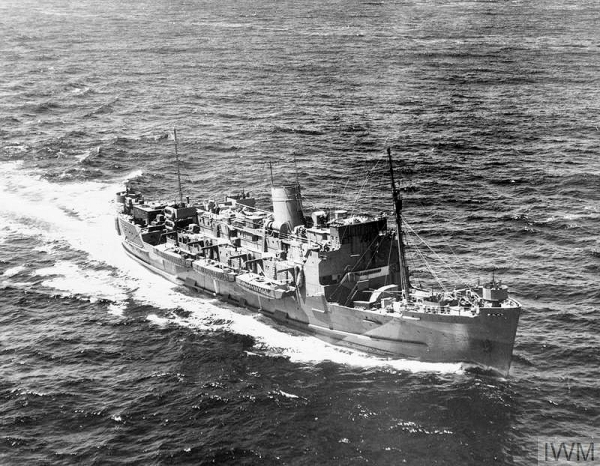 We then assisted on a couple of commando raids along the Italian coast and acted as a decoy ship by sailing close to the coast to attract gunfire from German shore positions, while The Nelson, Rodney and 2 cruisers located the gun emplacements from their flashes and returned fire from about 10 miles out. US Ranger Jud 'Lucky' Luckhurst recalls "Steve, I was with the US Rangers when they landed at Anzio. The two ships we used were the Royal Ulsterman and the Princess Beatrix. At my age, 82, it is hard for me to remember for sure but I think I landed with the Princess Beatrix. They were both the best. Many Rangers from other landing craft were drowned, because they were disembarked too soon. As a result a rumour spread that Col Darby asked for the Royal Ulsterman and the Princess Beatrix to be assigned to him for any further invasions. It was said by many of the Rangers, in admiration, that if those crazy Limey's had roller skates on the bottoms of their boats, they would even take us inland! I know that I was only wet up to my knees at Anzio. Some of the crew saved up their RN grog ration for their Ranger friends. The crew were a good bunch of men and were highly respected by the Rangers." We landed the troops at the Anzio beachhead. It started off quietly because the Germans had retreated inland but they counter-attacked and it ended in a bloody battle. Lots of lives were lost, including a large percentage of the American Rangers. Despite the heavy losses, it turned out all right in the end. Work for the LSIs in the Mediterranean was over but there were top secret plans in preparation for our next deployment. We returned home to 'Blighty' for a spot of leave and then preparations for D Day.... "the Big One." On return to the UK, we docked for 2 days in Greenock, then on to Southampton for repair work and new assault craft. 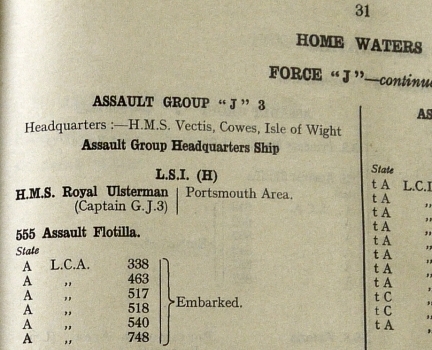 We embarked the assault troops at berth 37 in Southampton harbour and sailed from our holding position on the Solent at Area 19E, North of East Cowes, at 1600 hours on the 5th of June 1944.
a total assault force of approximately 400 men. The first of our troops were landed on NAN WHITE, at Berniers-Sur-Mer and NAN RED, at St Aubin-Sur-Mer at 1133 hours. These beaches were within an area of JUNO Beach. All troops were recorded ashore by 1150 hours. We lost some army lads when one of our LCAs was hit by gunfire. Our Sub-Lieutenant lost an arm. After the landings, we brought back wounded servicemen to England, shipping more troops to France on the return trip. This lasted quite a long period, after which it was easy going to de-mob. LSI(H) Royal Ulsterman came through with flying colours, just showing signs of her old age. It was a great honour to have served with S/M Freddie Robertson and the rest of the ship's company aboard LSI (H) Royal Ulsterman. I was really thrilled to see your page on The Royal Ulsterman. 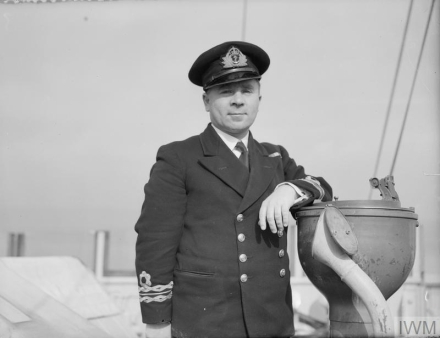 My grandfather, Captain Henry Paterson DSM, served with the Royal Navy through WWI and was in the Merchant Navy at the start of WW2. He was with Burns and Laird who provided a ferry service from Glasgow to Dublin/Belfast and Londonderry. During WW2 the ships of the line, including the Ulsterman, were commandeered for Navy use. My grampa was seconded to other duties as he was in the RNR. He served in the Narvik convoys amongst other duties and managed to survive both wars unscathed despite numerous close shaves. He was reunited with the Ulsterman after the War and remained Master of her, her sister ship and the Laird's Loch (on rotation) until his retiral in the mid 60s. Sadly, he died very shortly after retiral. His sons, William (my dad), and Harry served in WW2 also. 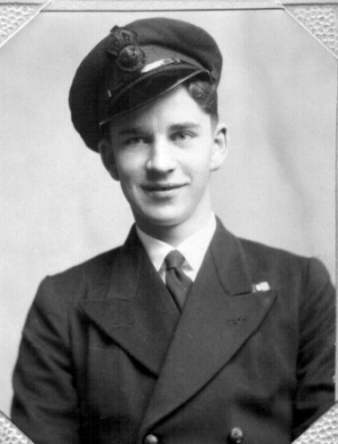 My dad, an ex Artilleryman, is still going strong, but my uncle was killed in his 21st year while serving in the Fleet Air Arm as a pilot. The Ulsterman went on until 1967 on the Irish routes and was later scrapped after being sunk off Beirut on 3rd March 1973. I believe she struck a mine. It seems such a pity to end in that way after her brave war service. I hope this is of interest to you! I was interested to read about HMS Royal Ulsterman. My father was in the North Nova Scotia Highland Regiment so the odds are good that he was on that ship when it sailed off to D-Day. Paul Schwartz, British Columbia, Canada. Written largely by crewman George H Saunders with contributions from Steve Robertson whose father, the late S/M Freddie Robertson, also served on HMS Royal Ulsterman.